Just to be clear what the NST were responding to: the ‘BBC report’ was the one made by Inside Out; and the ‘comments on social media’ were those made on this blog. Setting aside the fact that they can’t even be bothered to spell the deceased’s name correctly, it beggars belief that the NST took the time to contact everyone in the CofE with whom Matt Ineson has been in contact on this matter over the years – not only office-holders in the NST, but any individuals in the Sheffield Diocese, the Leeds Diocese and the Oxford Diocese who have responsibility for safeguarding. Did the NST bother, for example, to obtain written statements from Moira Murray or Jenny Price? The former is National Casework Manager for the National Safeguarding Team; the latter is the Diocesan Safeguarding Advisor for the Diocese of Leeds. These are just two of those with whom Devamanikkam’s mental health and suicide attempts were discussed (or Matt Ineson claims they were discussed). The parenthesis isn’t dismissive of his testimony; it is simply to acknowledge the fact that the recollections of both these women may well conflict with Matt Ineson’s. They are professional, honest people who do a very difficult job. They ought to have been given the time and courtesy (and legal right) to reflect and recount their conversations accurately. But in the brief space of time between Inside Out being broadcast, this blog publishing and the NST’s statement, it is not remotely plausible to believe that the NST traced and consulted Diocesan Safeguarding Officers in Sheffield, Leeds and Oxford in order to apprise themselves of all the necessary details. Since the illness is known to increase the risk of suicide, and this information is readily available simply by googling, why was a risk assessment not carried out? Is the NST really saying that all ‘mental health’ problems are treated uniformly; that a little hand-washing OCD is considered the same as bipolar disorder until one of them attempts suicide, and only then is a risk assessment undertaken? 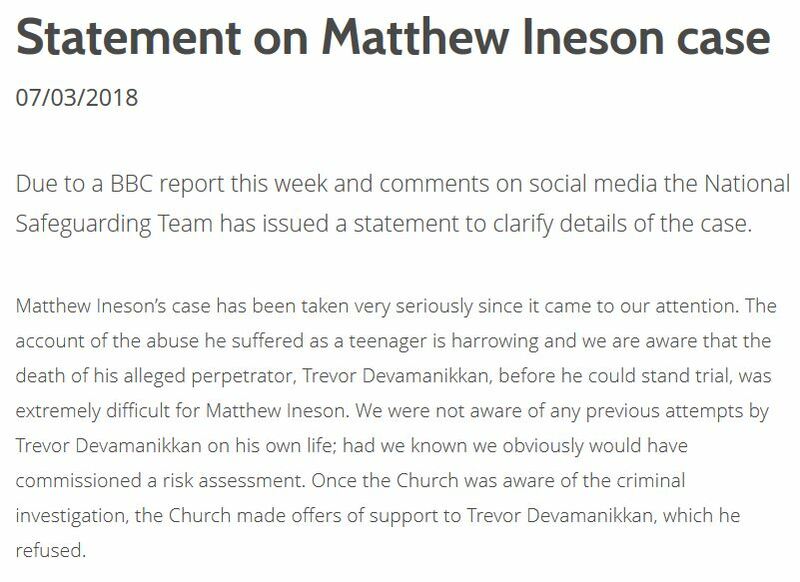 The church were informed by the police that Devamanikkam was under investigation, and they were informed when he had been charged. Surely, if it is commonly known (or may be easily discovered) that bipolar disorder carries a high risk of suicide (and it is a matter of common sense that being investigated and arrested by the police may heighten stress levels), a risk assessment needed to be carried out as an unequivocal matter of urgency? Had they done so, Trevor Devamanikkam may still be alive. If the NST’s statement is not untruthful, it is undoubtedly manifest evidence of serious incompetence, and that delinquency may well have contributed to Devamanikkam’s death. (Please don’t be deflected by: “..the Church made offers of support to Devamanikkam, which he refused.” He may well have done so, given his state of mind: the onus was still on the church to ensure his safety and well-being). 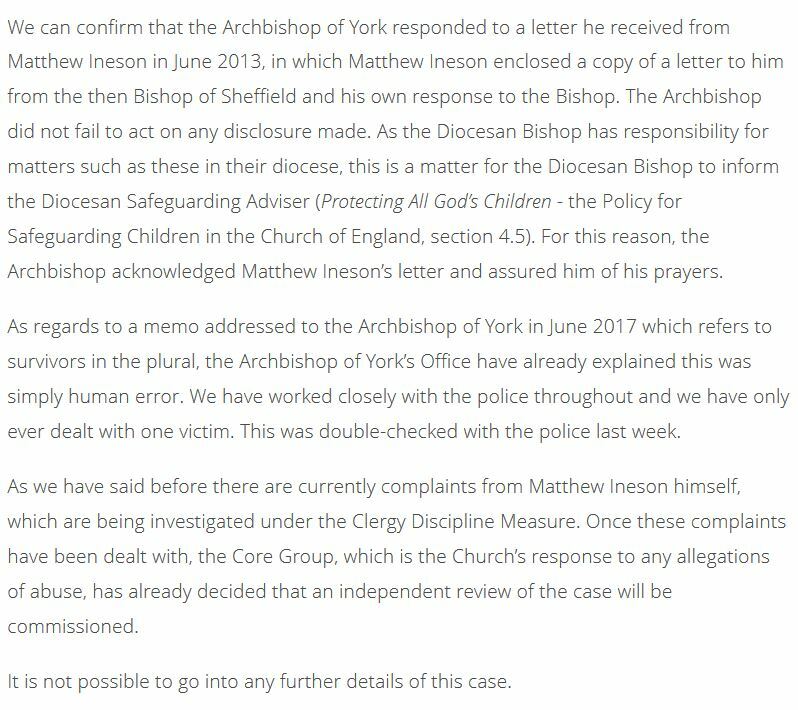 The second problem is that they give the impression that Matt Ineson’s complaints are already being investigated under the internal Clergy Discipline Measure (CDM) process. Yet poor Matt has been patiently tweeting for months and months about these CDMs, which are now considerably ‘out of time’. The CDM against Bishop Steven Croft is dated 23rd August 2017 and is 198 days old; and the one against Bishop Peter Burrows is dated 19th December 2017 and is 80 days old. They have been completely ignored by the church until the notification provided by the NST’s statement. The CDM allows 56 days for them to be completed. Under the procedure, if either the registrar or bishop wish to have an extension of time, they are required to consult the complainant and respondent before applying to the President of Tribunals for an extension. Matt Ineson has received no such request in either case, so these CDMs are inapplicable because they are inadmissible. Further, when an attempt was made to submit further information against Bishop Steven Croft (namely that he had admitted the complaint against him several times), Matt Ineson was informed by the President of Tribunals that no new evidence could be submitted if a complaint was ‘out of time’. Yet, curiously, the church appears to permitting itself the latitude to do precisely that. When this was challenged, no response was received. Indeed, the President of Tribunals has not had the courtesy to respond to any of the serious challenges made at all, such as the reason why cases against bishops have been summarily dismissed. The CDM has a statutory time-limit of 28 days for the President of Tribunals to review a decision and to make his own determination. That 28 days has now been exceeded by almost two weeks, again with no consultation for an extension received. The letter I sent to John Sentamu was a copy of a letter I had sent to Bishop Steven Croft, dated 1st June 2013, which not only contained details of my sexual abuse, but also complained bitterly of the failure to act on my disclosures by Bishop Steven Croft and Bishop Peter Burrows. By this time Steven Croft had ignored three disclosures from me, two by telephone and this letter of 1st June. John Sentamu replied saying he had read the letter and assured me of his prayers and best wishes through this testing time. Beyond that I was not offered any care, no support was given, I was not encouraged to report my abuse to the police nor was my disclosure(s) passed to the relevant church safeguarding officer or any other authority by him. In the statement by The Church of England’s National Safeguarding Team issued yesterday (above) it is claimed that the Archbishop did not fail to act on any disclosure made, because the responsibility to respond and act lay with the diocesan bishop, namely Steven Croft. The National Safeguarding Team are clearly stating here that Steven Croft should have acted. He didn’t and my abuser, The Revd Trevor Devamanikkam, was left 4 ½ years after my first disclosure to Steven Croft and 4 years after my correspondence with John Sentamu to potentially abuse again. He was charged in May 2017 with 6 serious charges of sexual abuse against me. Steven Croft has admitted on several occasions that I disclosed my abuse to him in the media over the past 16 months. I have pursued the complaint against Steven Croft’s failures several times with the church who have blocked any attempt at investigation into his failures. The National Safeguarding team now acknowledge those failures and I call on Steven Croft to resign with immediate effect. I also call upon Archbishop Sentamu to resign with immediate effect for failing to act on my disclosure to him and again, leaving my abuser for 4 years to potentially abuse again. Both these bishops failed to act in accordance with Church of England Safeguarding guidelines and left children and the vulnerable at risk of harm for over 4 years. Both bishops neglected their duties regarding safeguarding and John Sentamu neglected his duties by also not exercising his authority in terms of discipline over Steven Croft or Peter Burrows. He is in effect passing the buck and saying ‘not my job’. Is it now the case that clergy, even bishops and archbishops, can ignore disclosures of abuse by simply saying ‘not my job’. There was also a complete lack of pastoral care by both of them. 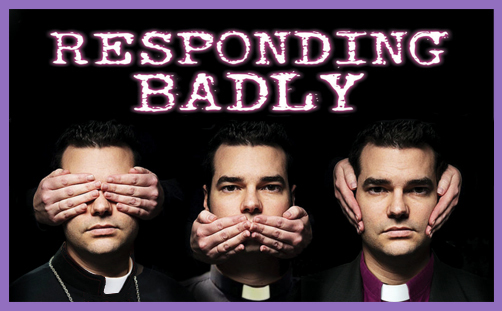 In the past two days two more people have contacted me to say that some of the bishops I have complained about have also failed them in a similar manner. Further, the memo addressed to the Archbishop in June 2017 refers to ‘survivors’ of Trevor Devamanikkam in the plural. The National Safeguarding Team dismiss this as being untrue and due to human error by the author of the memo. However, John Sentamu acknowledged, dated and signed this memo as ‘noted’. He therefore read that there were multiple victims of abuse and took no action or questioned this. This again potentially left other vulnerable people open to abuse. It may or may not be the case that there were other victims of Trevor Devamanikkam. That is not the issue here. The issue is that John Sentamu was told in writing there was, acknowledged that and did not act as required to do so. Also, I challenge the assertion that the National Safeguarding Team did not know that Trevor Devamanikkam had previously attempted to take his own life before his suicide. They did know, and no risk assessments or checks were carried out on him by anyone in The Church of England at all including the National Safeguarding team, anyone at diocesan level or by the diocesan bishop himself, Steven Croft. Once again I call for the immediate resignations of John Sentamu and Steven Croft for breaching safeguarding procedures which they are required to do by virtue of the public office they each respectively hold as bishops of the established church. If they refuse to do so, and the church refuses to hold them to account, we once again have the Church of England complicit and colluding with the abuse of children and the vulnerable and taking no action to prevent it. In calling for the resignation of John Sentamu, Matt Ineson has been joined today by distinguished Safeguarding consultant Ian Elliott (author of the Elliott Review). According to Christian Today, the Church of England intends to launch an independent review into the claims against the Archbishop of York. If this happens under the aegis of the NST, you can safely bet (very safely bet) that John Sentamu will be exonerated; his reputation and integrity will be unblemished. When the Church of England investigates Church of England bishops, the quality of mercy knows no limits; absolution and vindication abound – unless, of course, the bishop is dead or retired.